Pray for JAPAN - We are always with you! The Second Anniversary of the "The Great East Japan Earthquake"
Class on conducting ceremonies at the liaison conference of kokusaifukyoshi and dendoshi held by the North America Office. Soto Zen was first spread to North America by Rev. Hosen Isobe in 1922. At that time, the Buddhist faith was limited to Japanese immigrants. In addition to providing Buddhist services, such as funerals and memorial services, the organization has acted as a base for spreading traditional Japanese culture and entertainment as well as a place where people of Japanese descent can take a break and relax. It has carried the light of Buddhism in its various activities to this day. 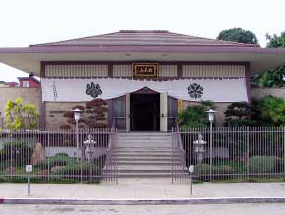 The Soto Zen Buddhism North America Office was established in 1937 when Zenshuji Soto Mission in Los Angeles was approved as a branch of both head temples, Eiheiji and Sojiji. 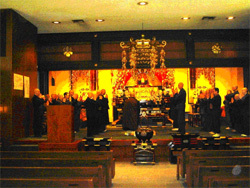 Following its establishment, the North America Office has performed a variety of activities including registration of temples and priests in North America, training sessions and workshops on rituals and ceremonies, sesshin’e (intensive day-and-night Zen meditation sessions), support and guidance for memorial events and special memorial services. It has also played a role in spreading Soto Zen Buddhism around the globe. When the office was first established, as was already mentioned in the opening paragraph, the main activities of the Soto Mission were focused on dispatching priests to temples built by immigrants who came to North America from Japan and propagation in areas where there was a large Japanese population. We are now three and four generations removed from those that paved the way, and the language has shifted to English. The activities of the Soto Mission have also changed accordingly. Even today, decades after the unfortunate events of World War II, many Japanese people come to North America on business, after getting married, or for studies. Many of these people visit the Mission as a place of refuge, as it is a pure Japanese temple where they can get a taste of home. In keeping with those circumstances, the activities of the office have expanded from mere clerical functions to looking for ways to develop temples for the future and set up various opportunities for the exchange of information and ideas between them. The focus is not only on Japanese temples and, particularly since the 1960's, Soto Zen has been gaining numbers across racial and cultural boundaries. Thanks to the tireless efforts of missionaries and religious workers, there are currently five Japanese temples in North America and more than 170 Zen centers (temples run by American priests), as well as more than 350 priests. Several temples from among these Zen centers and groups, which may be large or small, have formed a large organization that is engaged in dynamic mission work, including daily Zen training and doctrinal instruction based on Soto Zen teachings and community service in the surrounding communities. A few prime examples of these activities are instruction in Zazen and sermons at Zen groups established within prisons in each area, and spiritual care provided to students and patients by chaplains at schools and hospitals. These types of activities are evidence that as the number of Zen centers increases so does the number of priests. The North America Office receives the support of the Soto Zen Buddhism International Center to hold international missions conferences every year which include training sessions for various rituals. Priests from temples located all over North America come together in one place to talk with each other face to face and discuss their individual circumstances and the problems they come up against. The conferences provide them with the opportunity to sit down together and study rituals and ceremonies, thereby deepening their own understanding. This allows them to take the teachings that have been adapted to the local areas and ensure that they are developed according to the same standards and will bear fruit in the future. There are almost two hundred countries in the world, and each of them has its own constitution and laws; there is no one constitution or set of laws that applies throughout the world. Japan's laws are not effective in the United States or China, nor are the laws of other countries used in Japan. Each country has its own laws and, by extension, its own moral code. However, Buddhism transcends the boundaries of time and national borders and applies equally to all mankind. It is our hope that this website will serve as a resource for many people, including current practitioners and workers, to help increase interest in and deepen understanding of Sotoshu teachings. We also pray that more and more priests will become interested in global propagation of the Buddhist teaching, establishing a far-reaching vision and engaging in dissemination activities together with lay people in order to cultivate the teachings of the One Buddha and Our Two Founders around the world and deepen mutual understanding. In order to make that lofty goal a reality, the Soto Zen Buddhism North America Office will continue to take measured steps toward the expansion of our activities. 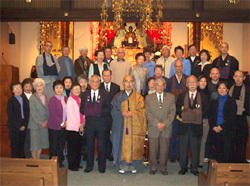 Grand ceremonies held in 2003 to commemorate the 80th anniversary of Soto Zen activity in North America. Address: 123 South Hewitt St, Los Angeles, CA 90012 U.S.A.